Contents Coaching & Mentoring ........................................................................................................................... 2 Corporate Communication & PR......................................................................................................... 2-3 Corporate Social Responsibility........................................................................................................................3 Entrepreneurship .................................................................................................................................... 4 Human Resource Management .......................................................................................................... 4-6 International Business & Cross-Cultural Management .......................................................................... 7 Management.........................................................................................................................................................8 Leadership ......................................................................................................................................... 8-10 Marketing ..........................................................................................................................................10-18 Organizational Behaviour & Organization Studies ................................................................................18 Research Methods & Statistics ....................................................................................................... 19-23 Strategy .................................................................................................................................................24 Study Skills ............................................................................................................................................24 Tourism, Hospitality & Events ......................................................................................................... 25-26 Library Collections ............................................................................................................................... 26 Index ................................................................................................................................................ 27-28 Ordering Information ............................................................................................................................ 28 Inspection Copies SAGE's inspection copy service allows lecturers to thoroughly review our textbooks before deciding whether to adopt them for use on courses. Request and manage your copies quickly and easily at sagepub.co.uk/inspectioncopy SAGE eBooks The majority of our books are now available as eBooks. 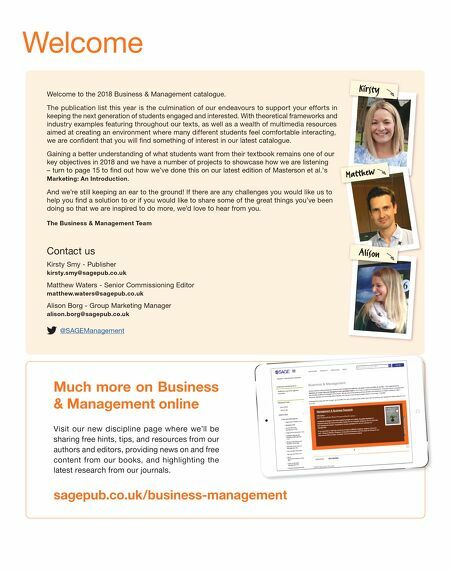 Visit sagepub.co.uk/ebooks for more information. Extra Teaching & Study Tools Many of our textbooks are supported by online resources to assist lecturers with planning and delivering engaging seminars and lectures, and to help students to explore topics further and check their progress. Wherever you see the online resources or SAGE edge icons, you can access further resources.